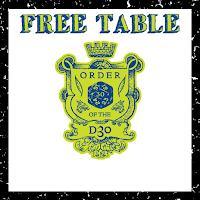 I just finished putting my newest d30 table up on DTRPG. The table is for randomly generating a horse. Why a horse? Because in my experience the player rarely ask about their steeds and I wanted to be able to quickly come up with some horses should the need arise. Now you might ask, "When would the need arise?" Again, in my experience the PCs being able to afford a horse or even enough horses for everyone to ride is the #1 factor of being able to move the campaign along. When just starting out a horse is usually far more than they can afford and once buying a horse is no big deal, the PCs just start thinking of them more in the lines of "equipment" than a valuable resource. Being able to take away the horse can help remedy that. Maybe thieves take the horse(s). 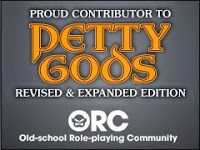 Can the PCs identify their steed(s) when the time comes? If not, I guess "that guy" isn't the horse thief. Click on either graphic to go to the appropriate download page.